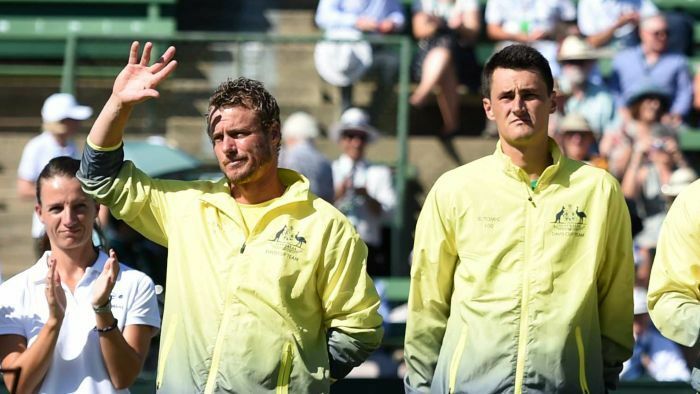 Bernard Tomic’s father says he will begin legal action against Davis Cup captain Lleyton Hewitt over an incident he alleges happened nine years ago, which he says left Tomic traumatised. John Tomic told the Sydney Morning Herald that Hewitt left his son traumatised when he was 17 following an incident in 2010 during a Davis Cup tie when he tried to pressure him into revealing who in Tennis Australia was “against” him. “Bernard said something on the television before that Lleyton didn’t like,” Tomic Sr said. While attempts to contact Fitzgerald were unsuccessful, the Sydney Morning Herald said it had contacted Hewitt’s manager David Drysdale about the alleged incident. “I know nothing about it and I’m not going to comment any further,” Drysdale said. “He tried to force him to say something,” Tomic Snr said. “Bernard was shocked, he couldn’t sleep all night. “We will prove that Bernard has trauma from 2010 when Bernard was the youngest player in Davis Cup for Australia,” he said.